Our CSA farmer told us he dehydrated watermelon and it turned out like delicious fruit leather. We have successfully dried bananas and apples in our food dehydrator so we were pretty excited. Aaron sliced up half a watermelon and it sat in the hydrator for 24 hours. It tasted horrible. It tasted like rotten watermelon. Anyone out there ever dehydrate watermelon with better results? Or have other good dehydrating ideas/recipes? If you're willing to experiment, maybe puree the watermelon and put it in a strainer to let some of the liquid drain off before attempting to dehydrate it. (Drink the watermelon juice.) I think leathers really benefit from pectin, too, so I might mix in some applesauce. In a dehydrator, put the slices on the lowest rack, or the one nearest the coil. If you're drying a full run of melon, leave the racks in place for three or four hours, then put the bottom rack on the top and move each rack one step downward. Keep rotating the trays every few hours until all the melon pieces are uniformly dry to the touch. Don't take the. melon out while it's still gummy; if you do, it'll cling to your teeth. Instead, wait until it snaps when you bend it, like bacon that's been fried to a crispy state. NOTE: Be warned that dehydrating watermelon can be a time- and energy-intensive process. I found that it took 18-20 hours in an electric dehydrator set at 135° to thoroughly dry 1/2" slices. My dad used to dehydrate applesauce when I was a kid. The end result was basically a fruit roll up, but it was really tasty! I've often craved those as an adult--and I'd be interested to see what would come of the new flavors of applesauce that I've seen out there. Only one catch--you obviously need a special disk that you put in your dehydrator to keep all the yummy applesauce from falling through the cracks! If you pull out the water from the watermelon... isn't it easier just buying a melon? Why in the world would you want to dehydrate a watermelon anyway? A big part of the experience of eating a watermelon is the delicious, sweet juiciness of it. I think you are going to far in your 'experimentation'...but that is just MHO. This is hilarious. I LOVE watermelon and a while back I contemplated getting a dehydrator. I kept joking about drying watermelon because I thought it impossible. Good luck! anonymous - thanks for the tips! cheri - applesauce sounds cool! anonymous - I love fresh watermelon too, but it isn't very portable. Eating it say... in the car is messy. I just wanted to see how it would be. We only dried half a watermelon and ate the rest fresh. oh my. i always wondered what dehydrated watermelon would taste like after seeing those ronco infomercials. thanks for the heads up. In my blog you can find a lot of photos of dehydrated fruits and vegetables. I bought an Excalibur. Yet, it´s a Portuguese Blog. Only titles are in 2 or 3 languages (English, French and Portuguese). But there is a lot of photos. I really like this delicious and dehydrated watermelon, it is one of my favorite fruit, also I frequently eat it so that I can get a lot of carbohydrates. 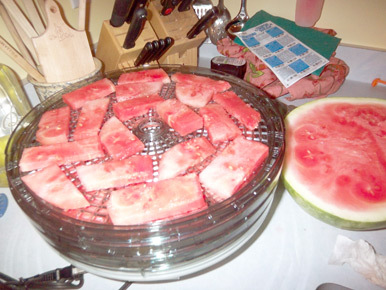 My Nesco food dehydrator does a great job dehydrating watermelon slices to make tasty watermelon chip jerky snacks. I cut very thin slices of watermelon and they are totally dry after only 12 hours of dehydrating time.